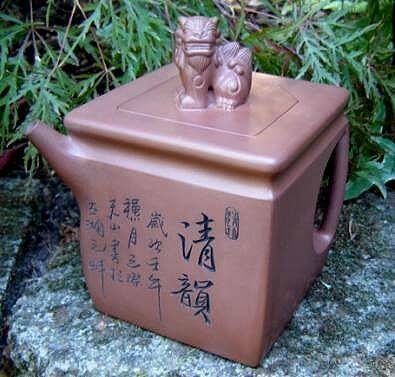 Yixing zisha clay teapots from Yixing, China. 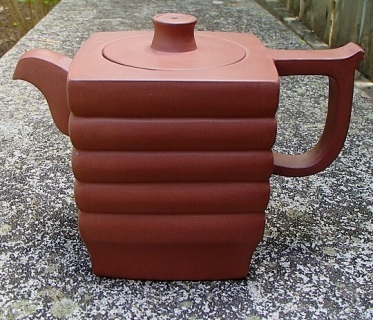 A study in shapes, this Yixing teapot has a squared handle and spout while the body has more rounded, smooth undulating waves stacked into a design that looks very much like a classic pagoda. The color is a rich milk chocolate and the pour is supreme. This fabulous, chocolate brown teapot is very distinctive with a square shape and a proud, detailed lion perched on the lid. Chinese characters and reflections on nature are etched in the two faces adjoining the spout. Note: this design does not have a built in strainer. This artisan design from Xiao Ma represents a leopard and is crafted with extra fine zisha clay. An inlay technique is used to create the trademark spots. 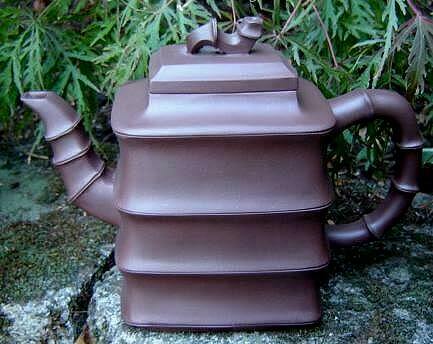 Details are then added to define each spot and to create shadows around the spout and 'tail' handle. A lucky Chinese coin is carved into the knob on the lid. Mr. Ma's mark appears on the base and inside the lid. 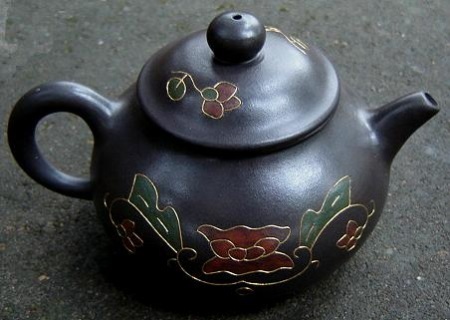 This lovely charcoal brown Yixing teapot is decorated with variegated red flowers and green leaves, each delicately defined with fine gold wire inlay. A beautiful work of art that makes a wonderful cup of tea. Stunning. 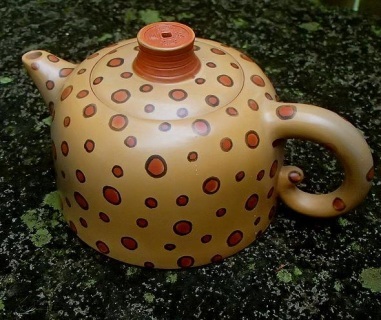 Ms. Yin Qifen created a completely unique and very fun teapot. 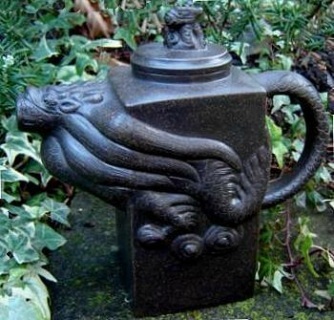 The dark zisha clay is organically dynamic and the perfect foundation for a magnificent dragon as he curls around the teapot forming both the handle and the spout with a tiny little dragon perching on the lid. The artist's mark appears on the base and inside the lid. The teapot will actually hold a bit more than the declared 18 ounce capacity, but water may spill from the extra generous spout so I recommend filling to about 3/4" from the top.